It's time to take a closer look at your beauty routine. There's no talking about beauty without first covering hygiene. Although maintaining a beauty routine is easier said than done, there's no reason not to take better care of the body parts listed below. Read on to see how your routine fares on this scale. 1. Treat your scalp right. Your tresses won't be worth calling your crowning glory if there's dirt—or dandruff—stuck on it. Remedy this by massaging two tablespoons of lemon juice onto your scalp, then rinse it off with water. After which, stir a teaspoon of lemon juice into a cup of water and rinse your hair with it. Repeat this daily until your dandruff disappears. 2. Take better care of your ears. You should know better than to jam cotton buds into your ears by now. This does more harm than good as it pushes ear wax deeper into the ear canal. Instead, cleanse the outer ear with soapy fingers in the shower. Its many folds are the perfect hiding spot for dirt, so be sure to get in there! 3. Pay attention to your nape. Don't think that the shampoo on your tresses excuses you from soaping the back of your neck. Now, lather up with your favorite body wash.
4. Wash your hands religiously. Be sure to keep it professional with germ-free hands. It's better for your health because, as you may know by now, handwashing is among the best deterrents of the spread of diseases. P.S. The whole thing should take around 20 seconds. Running your hands under the tap does not count. 5. Keep your fingernails trimmed. Your nails may no longer need a weekly inspection from your kindergarden teacher, but you certainly still are getting judged for it. Luckily, there's Bobbie Total Nail Care Solution, which includes clippers, pushers, and nippers—as well as nail enamels, polish removers, cuticle tint, and extensions! It's your one-stop brand for anything and everything nail-related. Dark knees are the enemy of micro minis and Daisy Dukes, so there really is no excuse for you to forget this body part. Be sure to wash your knees in the bath as you would your elbows: Quickly but efficiently! 7. Don't forget about your feet. Never overlook your feet! After all, people can tell a lot about you and your hygiene just by looking at them. Always keep those nails in check, especially if you're considering open-toe footwear. And JSYK, the Bobbie Total Nail Care Solution can help! 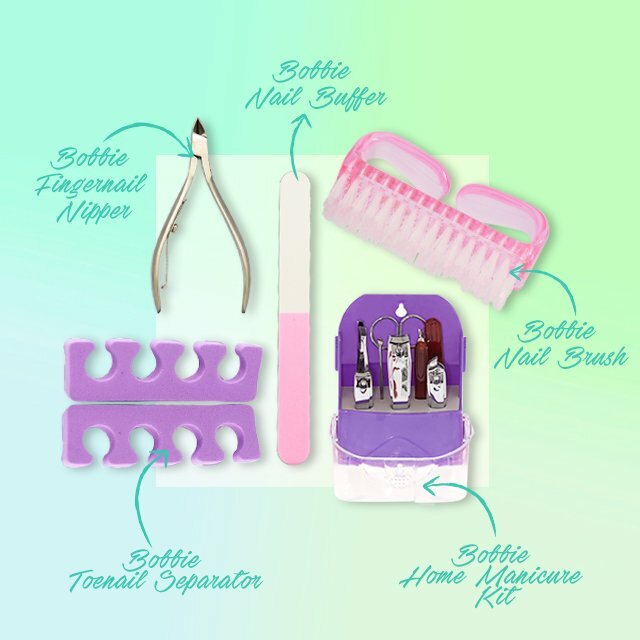 Bobbie Nails is "The Total Nail Care Solution," which offers the complete nail care line—from beauty implements to removers (CLEAN), nail crèmes (COLOR) to nail basics and treatments (CARE). Click here to know more. This article was created by Summit Storylabs in partnership with Bobbie Nails.